We’d love your help. 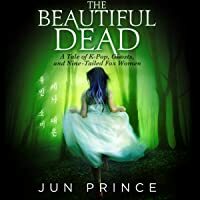 Let us know what’s wrong with this preview of The Beautiful Dead by Jun Prince. Yubin knows she’s different than the other girls in the pop group SIITY. Yes, they all got sucked into the same machine, giving up schooling and signing ridiculously long contracts with no guarantee of success, but that's how Korean stars are made. Yubin is supposed to be thankful for that, but she isn't. She doesn't even like the girls she performs with. She’s more connec Yubin knows she’s different than the other girls in the pop group SIITY. Yes, they all got sucked into the same machine, giving up schooling and signing ridiculously long contracts with no guarantee of success, but that's how Korean stars are made. Yubin is supposed to be thankful for that, but she isn't. She doesn't even like the girls she performs with. She’s more connected to her former schoolmate Jieun, even though all they ever do is text. Over the last two months, Jieun has become her confidant and best friend, connecting Yubin to the real world in a way she desperately needs. Now that SIITY is going to appear on the reality show Incredible Race: Asia, Yubin will need that connection more than ever, which is why she’s devastated to discover Jieun has been dead five years and is actually haunting her. To ask other readers questions about The Beautiful Dead, please sign up. 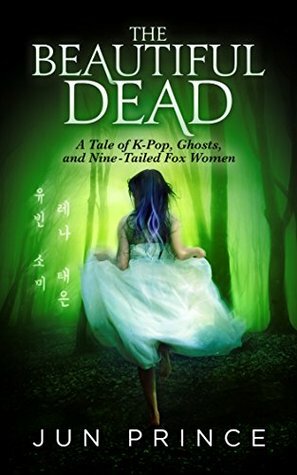 The Beautiful Dead: A Tale of K-Pop, Ghosts, and Nine-Tailed Fox Women is a unique novel that exposes the chaotic and dark world of Korean K-pop and reality TV, while interweaving the unnatural world of Korean ghosts and supernatural creatures. While it may seem an odd mix, it totally works to allow us, the readers, to view the star's lives both from the girls' perspectives, and from the wider perspective of the creatures of the ether. We meet the four members of the girl K-pop group SIITY -- Yub The Beautiful Dead: A Tale of K-Pop, Ghosts, and Nine-Tailed Fox Women is a unique novel that exposes the chaotic and dark world of Korean K-pop and reality TV, while interweaving the unnatural world of Korean ghosts and supernatural creatures. While it may seem an odd mix, it totally works to allow us, the readers, to view the star's lives both from the girls' perspectives, and from the wider perspective of the creatures of the ether. We meet the four members of the girl K-pop group SIITY -- Yubin, Tae-eun, Rena and Somi -- each of whom has her own set of struggles stemming from the regimented cultivation of their pop stardom. A jealous ghost, Jieun, imposes herself into their crowded and lonely lives, and at times helps them survive exploitation, manipulation, insecurities, and, above all, loneliness. Some scenes are dark and unnerving, others are playful and lighthearted, and all of them tug at your heartstrings. "They were all in it together. Together, they could all savor success. They all labored under the same exhaustion. It was therefore a shame she felt so alone." Each girl's challenges are totally relatable -- they are so easy to visualize, since the writing is creative and colorful -- and we ache to see them survive this off-kilter life each has chosen (or been bullied) to live. I do not know if this is a standalone novel, or if it might be the beginning of a series, but I would love to read more about these wonderfully flawed girls and delve deeper into Korean culture and mythology with them. The setting is very realistic. Everything is just so accurate. I've been to Korea several times and I could tell that the author had done a lot of research (he lived in Korea I think?) In the book, the girls go to Baskin-Robbins (those stores are all scattered over South Korea - they're everywhere!) and the author even wrote very briefly about Family Mart and GS25. This is 100% *tries to find a synonym for realistic / accurate but fails* realistic! This book is written in the POV of different band mates. Through getting into the heads of different characters, I got to learn more about their insecurities and worries and found out that life as a Korean idol isn't so perfect after all. My favorite character is definitely Somi. She has the same name as my Produce 101 Season One bias - Jeon Somi (SHE IS SO FREAKING TALENTED), deaf in one ear and has ADD. She tries her best to fit in and sometimes feels that her band mates pity her because of her disability. I want to hug her and tell her that's not true! Somi's super outgoing, bubbly and nice and honestly, if I got to meet her in real life, I would love to be her friend! Tae-eun's grandma is the coolest! She's a foxwoman and she knows how to perform magic. She is very mischievous and performs tricks all the time. She's actually Tae-eun's great great great great great great... grandmother, but she doesn't act like an old person. Instead she's full of energy and super cheeky! Another thing I like about this book is that the friendship between the SIITY girls. At first, Yubin doesn't really trust her band mates, and I enjoyed reading about how they get closer and endure difficulties together. They support each other and aaahh girls supporting girls is just something I don't see very often in books I LOVE IT SO MUCH THIS HAS TO APPEAR MORE IN BOOKS. Also, I got to learn more about Korean mythology! I am totally unfamiliar with it and turns out there are mythical creatures called Gumiho which are nine-tailed foxes. When I was young, I read about its Chinese counterpart, Huli Jing. I didn't know that nine-tailed foxes exist in Korean folklore as well! I didn't like Jieun. She's so selfish and sadistic. Later in the story she becomes Yubin's friend and (tries to) stop harming people. However, she's still violent and calls Yubin terrible things ("whore", "b*tch", etc.) Also I find it creepy how she calls the girls hers. It makes me feel that she treats them as her possessions, which is just wrong. I really enjoyed this entertaining and unusual audiobook. The unique storyline easily draws you in and takes you into a world of pop idols, ghosts, empaths, vampires and nine tail foxes. I knew nothing of the Korean k-pop culture before listening to this book and I found that fascinating in itself, as well as it having a great storyline. The story is told from various individual POVs, showing the thoughts, fears, insecurities and emotions of each character with a few unexpected twists mixed in. I really enjoyed this entertaining and unusual audiobook. The unique storyline easily draws you in and takes you into a world of pop idols, ghosts, empaths, vampires and nine tail foxes. I knew nothing of the Korean k-pop culture before listening to this book and I found that fascinating in itself, as well as it having a great storyline. The story is told from various individual POVs, showing the thoughts, fears, insecurities and emotions of each character with a few unexpected twists mixed in. I loved that all his idols were not model perfect and that he showed some of the nastier side of show business too. The narrator did an excellent job. She brought out the unique personalities and gave the characters individual voices. Her clear delineation of characters helped me greatly, as I did struggle a little with the various names at first, but that speaks more to my lack of knowledge of Asian names than it does the writing or the narration. This is an unusual and very enjoyable story and I will look forward to other books by this author in the future. Yubin never imagined how much her life would change when she accepted becoming a member of the pop group, SIITY. Part of her wants to be grateful of the life she's been given, yet she finds it hard to do just that. Everywhere she turns, pain and heartache follows. To make things worse, the only person she can count on has been dead for years. When the group's world is torn asunder, she soon realizes she'll need to rely on the rest of them if they're all to survive the chaos hounding their every Yubin never imagined how much her life would change when she accepted becoming a member of the pop group, SIITY. Part of her wants to be grateful of the life she's been given, yet she finds it hard to do just that. Everywhere she turns, pain and heartache follows. To make things worse, the only person she can count on has been dead for years. When the group's world is torn asunder, she soon realizes she'll need to rely on the rest of them if they're all to survive the chaos hounding their every move. The Beautiful Dead is unlike any story I've ever read before. It opened my eyes to the all things surrounding the world of K-Pop. Though I've heard about K-Pop and do have quite a few friends that are fans of it, I've never been one to dive deeper into that world. Nevertheless, I like the way the author broadens the horizon for those of us who are a tad unfamiliar with everything K-Pop entails. Jun gives us a story about a group catapulted into the spotlight. A group who's been given the opportunity to capture the hearts of millions out there. These are people who are going through so much within their everyday lives, yet they're banding together to follow a dream they never truly imagined. All of them have to contend with said pain and heartache in order to use it to their advantage. K-pop, Gumihos, ghosts, psychics, and more? Freaking amazing. Not to mention the book isn't scared to approach problems within the Korean entertainment industry. Now here’s the void in my reading life that I didn’t realise I had: K-pop paranormal drama. Prince is an amazing writer, she gave each character their own distinctive voices and personalities which, though I didn’t really like them all, made them a pleasure to listen to/read. Yubin, one of the main character, is an empath and presumably one of the characters we should like the most but I didn’t like her mentality at all – she openly admits to herself that she doesn’t socialise with her bandmates Now here’s the void in my reading life that I didn’t realise I had: K-pop paranormal drama. Yubin, one of the main character, is an empath and presumably one of the characters we should like the most but I didn’t like her mentality at all – she openly admits to herself that she doesn’t socialise with her bandmates or anyone else because they’re not worth her time and she’s superior to them. Yeeeesh, even if she does get better over time I’m not a huge fan of her attitude. Her bandmates all have their own issues going on, both supernatural and real-world. I really liked the fact that Somi, one of the bandmates, has ADHD and only has partial hearing which are both presented as character traits rather than exploited or used as a cheap plot device. It’s funny that I could really empathise with all of the characters apart from the empath! In terms of violence and action, this book starts off with mild supernatural content and then works its way up to a wonderfully violent conclusion, with some mild gore, which I really enjoyed. These young women are finally starting to bond when they find out the have the weird and wonderful in common. You get to meet shapeshifters, magic, poltergeists and psychic powers which are presented in a way you may not have read before. I listened to the audiobook version of this story and Amy Landon did a brilliant job of narrating, she does a variety of different character voices with Korean accents and does so convincingly and without overdoing it (a pet hate of mine). Her reading voice is both interesting and relaxing which I enjoyed. This is an 11.5 hour audiobook and I listened to it in long chunks without any loss of attention! Fingers crossed there’ll be another book out with these characters but I’ll be waiting for the audio to get the full effect. I was really surprised at all that happened and overflowed well together. Hoping to get to the next book soon. This is a difficult review to write. I’ll tackle the two main issues I had with this book. was a Kpop and Korean ghost story. I wanted to enjoy to this. I WANTED this to be a book to get excited to read. I expected a light paranormal ghost story with perhaps a touch of romance worthy of a Kdrama. The book was not that. I felt lied to by the cover and blurb. The book had some minor grammar issues, mostly the lack of commas. Especially on dialogue tags that prec This is a difficult review to write. I’ll tackle the two main issues I had with this book. The book had some minor grammar issues, mostly the lack of commas. Especially on dialogue tags that precede the quote. Other than that, it was just the common errors that you can also see in traditional published books. There was some adult language and sexual situations. I feel this book needs a trigger alert. I was drawn to this story because of the subject matter. A K-Pop girl group with supernatural powers? How cool and unique is that? This book certainly had lots of things I've never seen before in Fantasy literature. I was fascinated by the introduction to Korean folklore, and by the inside look into the world of K-Pop. That being said, the book had its issues. It suffered from the lack of an editor, who might have caught grammar mistakes (like using through for threw, for example). There also didn't seem to be enough build up for many events - things just happened with no warning or explanation. Too often I found myself thinking, "wait, what's happening here? ", and not in a good way. Korean pop stars sometimes are friends,sometimes aren't.They don't know as much about each other as one would think.As it turns out,some have overbearing dads,shapshifting grandmas,entertain ghosts or want to go to college.More of a YA tale,this is a really good book with a lot of twists and turns. Amy Landon was the perfect narrator. I was given this book by the narrator,author or publisher free for an honest review.